I recently returned from a trip to South Africa with my three-year-old son. We spent a period of time living in the African bush whilst participating in the daily life of animal conservation. A trip with a toddler on my own was a whole experience in itself, but watching him grow and relate to his surroundings in a way I had never witnessed before, far outweighed the tediousness of toddler tantrums and too much luggage. We had been lucky enough to live in the British countryside up until then, but as is often the case in modern western society, I hadn’t found myself dancing and prancing endlessly in flower strewn meadows and running barefoot and fancy free in nature as I had envisaged in my pre-birth fantasy. Quite proud of the fact that he was still alive every morning and that I managed to get myself dressed and out to the shops at some point in the day was achievement enough. So taking a leap to travel to a rural foreign country for an extended period of time was a little bit the result of a crazed need for a shakeup and some adventure. The result was the both of us being introduced to the wild natural world that existed beyond the TV screen and the picture books. My son, even became a self-proclaimed vegetarian when he realised that the pink or red stuff we sometimes cooked and ate, was meat from animals. He decided he didn’t want to hurt or eat animals any more and that ‘ animals are there for us to love mummy, not eat.’ I kid you not, he actually said that, followed by a made-up ditty about not eating animals which went on a little too long. This isn’t going to be a ‘to eat or not eat meat’ debate. It’s rather an observation as to how interacting with nature in a close-up and personal way allowed the child to make his own choices about how he wanted to interact with it in the future. It highlights how detached children are with nature nowadays, so that it isn’t real or important to them anymore. 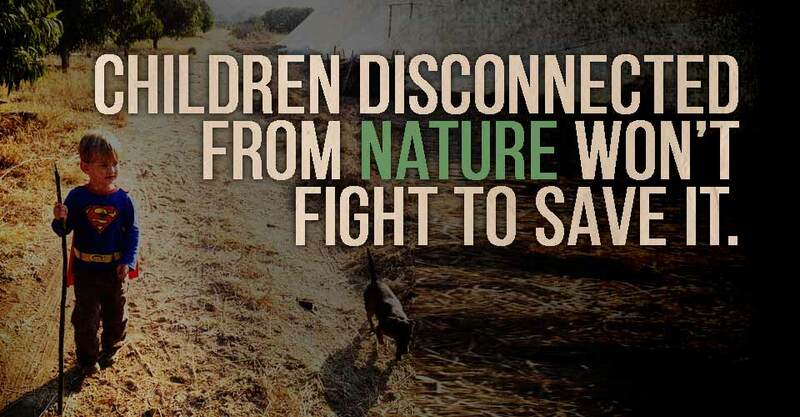 The remarkable collapse of children’s engagement with nature – which is even faster than the collapse of the natural world – is recorded in Richard Louv’s book Last Child in the Woods, and in a report published recently by the National Trust. Within a few weeks of staying in South Africa with my infant son, he was fearlessly (whilst supervised) embracing large dogs twice his size, before this he had shied away from them on the streets in the UK. He recognised the time of day by the shadow on the mountain. He could spot snake holes in the sand and identify Lion stool from Hyena stool and knew the call of a Zebra from that of a Baboon. He helped blindfold a sedated Buffalo who was being transported to more food rich ground, fed carrots to (semi tame) Zebras and could impersonate a Giraffe. Gloating aside, he was connected and plugged in, these animals and experiences were vital and remain with him today in a very real way. I know not everyone will be as lucky (or as foolhardy) as I was to travel to such an exotic land with a small child. But the nature is all around us and the adventure begins at home. Edith Cobb proposed In her famous essay The Ecology of Imagination in Childhood, that contact with nature stimulates creativity. Reviewing the biographies of 300 “geniuses”, she exposed a common theme: intense experiences of the natural world in the middle age of childhood (between five and 12). Animals and plants, she contended, are among “the figures of speech in the rhetoric of play … which the genius in particular of later life seems to recall”. Natural spaces encourage fantasy and roleplay, reasoning and observation and studies in several nations show that children’s games are more creative in green places than in concrete playgrounds. The social standing of children there depends less on physical dominance, more on inventiveness and language skills. Perhaps forcing children to study so much, rather than running wild in the woods and fields, is counter-productive? And that pretty much sums it up, the planet and its desperate need of protection against those who inhabit it is doomed if we do not unplug the children from their screens and push them out to be part of it. After all, what have they got to lose if they don’t use it anyway? They are the future generations and our only hope. Forest Schools, planned expeditions and outdoor holiday organisations do exist to help families reconnect their children back to nature, as well as there being endless online forums and books with ideas on what to do outside in sun, rain or shine. The messier the better for the little ones. As for my son, he still asks to go back to Africa ‘to see his animals’. He is still a vegetarian and we hope to go back there soon. Do you think the planet is safe in the hands of our children? What do you think about the future generations understanding of the natural world?